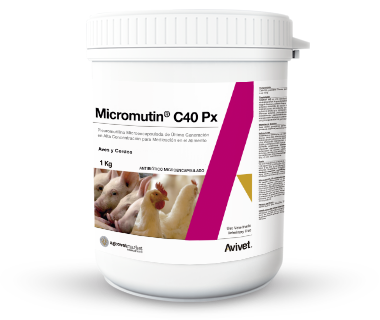 Micromutin® C40 Px is a highly effective antibiotic product based on microencapsulated granules for the medication of poultry and swine food. It provides 400 mg / g of activity. The microencapsulation gives stability, better antibacterial action, allows a more homogeneous mixing and less loss of the product, also masks the bitter taste of tiamulin. Treatment, prevention and/or control of respiratory and enteric diseases caused by microorganisms sensitive to tiamulin. Poultry: Chronic respiratory disease (mycoplasmosis), air sacculitis and infectious sinusitis, coryza, diseases caused by Streptococcus spp. and Clostridium perfringens. Swine: Dysentery, swine colitis, ileitis, spirochetosis, enzootic pneumonia and pleuropneumonia. Poultry: Therapeutic: 625 - 1,250 g TM food / daily for 3 - 5 days. Posture: growth promoter: 25 - 50 g TM food. Preventive: 75 - 125 g TM food. Swine: Therapeutic: 250 - 500 g TM food / daily for 5 -10 days.